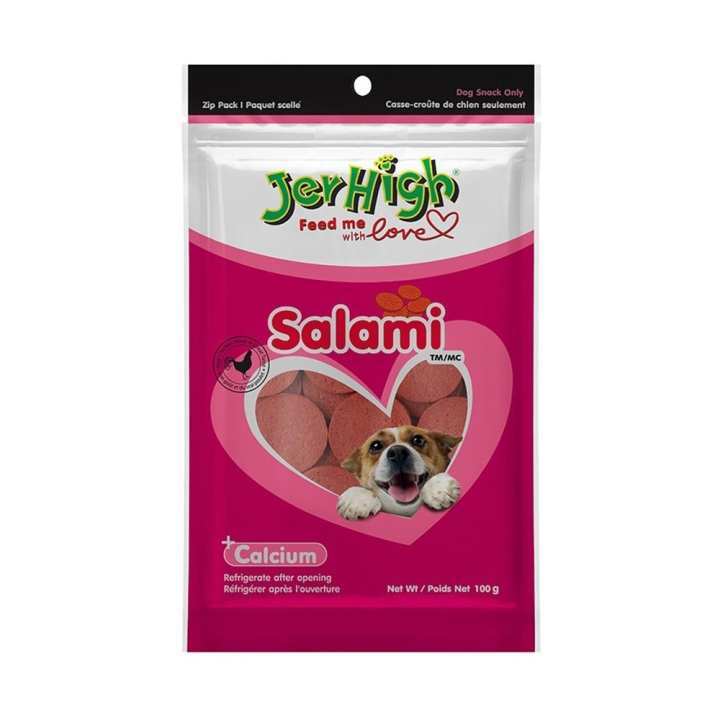 Jerhigh Salami is a premium snack filled with nutrients and vitamins to make your dog healthy and strong, with a tempting chicken flavor that your dog won’t be able to resist. Jerhigh Salami is made from real chicken meat and has been meticulously prepared by our highly experienced expert team. You can rest assured that JerHigh Salami is the perfect reward that your favorite canine deserves. It’s presented in a salami sausage-shaped snack, great for all dog breeds. Nutritious and delicious, it’s the perfect treat to reward your special friend! The tempting treats consist of appropriate amounts of protein, fats, carbohydrates, fibre and moisture. In this dog treat combo, you will find various supplementary elements like vitamin A, zinc, vitamin E, L-carnitine, inulin, vitamin D3, B1, B5, B6 and B12.